… National Chili Month, National Apple Month and National Pork Month. Yes, all in October. Who decides these things? Whoever you are, we thank you. To celebrate, we offer you recipes that involve one or more of these, because we don’t have one for pork and apple chili. But that could be interesting…Happy October! Anasazi beans are a cross between kidney and pinto beans. They hold their shape beautifully in this spicy buffalo chili recipe by Steve Sando. 1. Soak beans overnight in water at room temperature. 2. After soaking, put the beans in a large pot with their soaking water and enough cold water to cover the beans by 1 inch. Bring to a boil. Add one-third of the onions and half of the chopped garlic. Reduce the heat to low and simmer, partially covered, until the beans are nearly done, about 1 hour. Season with salt. 3. Meanwhile, in a soup pot or Dutch oven over medium-high heat, warm the oil. Add the meat, season with salt, and cook, stirring, until the meat loses all of its pink color and begins to brown. Remove with a slotted spoon and set aside. Pour off most of the fat. 5. If you’d like a thicker chili, dissolve the masa harina in 1/2 cup water, stirring well to eliminate lumps. Stir the paste into the chili, add the nopales, adjust the seasonings, and cook for 10 minutes. Ladle the chili into warmed bowls. Pass the sour cream, grated cheese, green onions, and cilantro at the table. CHEF’S NOTE: Any of the pinto beans will work nicely in this chili, as will Vallarta, yellow Indian woman, or black beans. 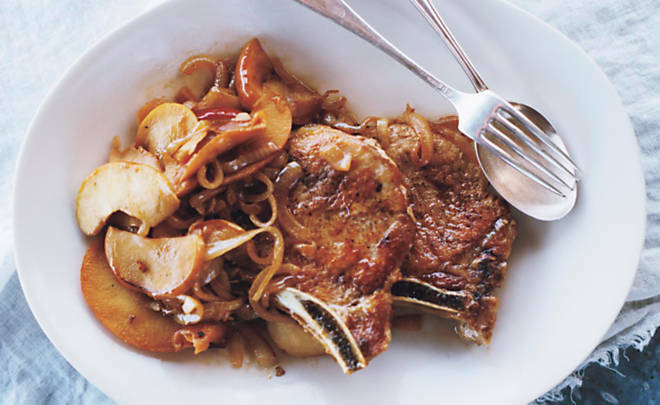 Lucinda Scala Quinn’s homey pork chops with apples and cider are sure to become a family favorite. The perfect recipe to celebrate the apple harvest! 1. Trim the chops of excess fat and sprinkle generously with salt and pepper on both sides. Heat a 14-inch cast-iron skillet (if you have a smaller one, you’ll need to work in batches) over high heat, and then swirl in the olive oil. Lay the pork chops in the pan and don’t move for a few minutes. This assures a good golden sear. Turn the chops over and brown well on the second side for a total of about 10 minutes. Remove the chops to a warm plate. 2. Swirl the butter into the pan. Add the onion and apples. Sauté until the onion slices are lightly caramelized and the apples have begun to soften, about 8 minutes. Stir in the beer or other liquid. Return the chops to the pan. 3. Cook until the pork is tender, about 15 more minutes (depending on the size of the chops), turning halfway through and covering the chops with the apple mixture. If the apple mixture needs a little thickening, remove the chops to the warm plate again and simmer the mixture on high for a few minutes to reduce. Serve the chops over rice or mashed potatoes with a large spoonful of the apple-onion mixture over the top. There is no reason to wait for Hanukkah to make these golden potato pancakes. After all, it’s National Apple Month. First the pancakes are crisped in duck fat and then crowned with silky foie gras and tart apple. 1. Combine sliced apples with simple syrup in a bowl and soak for 8 hours or overnight. 2. Add apple trimmings to demi-glace, bring to a boil, then simmer for 30 minutes. Strain and keep warm. 3. Grate potatoes, red apple, and onion. Gently stir in parsley, egg, and flour, and season with salt and pepper. Heat enough duck fat to measure about ½ inches deep in a large heavy skillet. Form mixture into 12 pancakes. If too moist, add a little more flour. When fat is hot, about 375 degrees F, add only as many pancakes as will comfortably fit in pan without crowding, flattening them slightly. Cook until browned and crispy on both sides, turning once. Remove with a slotted spatula, blot on paper towels, and keep warm in a warm oven.Discard fat and wipe out pan. 4. Heat pan until very hot. Season foie gras with salt and pepper, and sauté until lightly browned and medium-rare inside, about 45 seconds per side. 5. On warm plates, place a potato pancake, then add an apple slice and a foie gras medallion on top. Spoon on sauce, and serve.